Windows Vista was Microsoft's successor to Windows XP, superseded in 2009 by Windows 7. It came in 6 different versions: Ultimate, Home Premium, Home Basic, Starter, Business and Enterprise edition. All versions except Starter were available for both 32-bit and 64-bit processor types. Business users were also entitled to downgrade to Windows XP for compatibility with old applications. Windows Vista's Aero interface with gadgets on the right side. 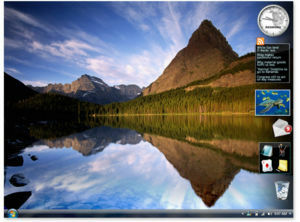 All versions of Vista came with Windows DVD Maker, .NET Framework 3.0, DirectX 10, Windows Sidebar, Backup and Restore Center, Windows Mail, Windows Calendar, Windows Photo Gallery, Internet Explorer 7, Windows Meeting Space, Windows SideShow, Speech recognition, Windows Contacts, Windows Media Player 11. A new technology called SuperFetch, which analyzed the usage pattern of a user then decides on which content should be loaded into system memory at any given time was included in Windows Vista. A primitive version of SuperFetch called Prefetch was actually included in Windows XP. Enterprise and Ultimate editions of Vista came with BitLocker Drive Encryption feature that allowed real-time encryption of an entire hard-drive partition using 128-bit AES encryption. The encryption key itself can be stored in the Trusted Platform Module chip on a computer's motherboard or in a USB key. Vista also included Digital Rights Management (DRM) software which was designed to prevent illegal copying of programs. This feature engendered much controversy as users reported it prevented legitimate uses. Vista also pioneered User Account Control, a new feature designed to help prevent computer viruses and other malware. When a program tries to perform functions that require system administrator privileges, the operating system shows the user a confirmation box. If the user himself does not have system administrator privileges, he is required to enter an administrator password; otherwise, he must click an "OK" box. This feature has been criticized for irritating users legitimately trying to perform these operations. According to Microsoft, a computer needs to have at minimum an 800 MHz processor, 512 MB RAM to run Windows Vista. And in order to take advantage of Vista's new Aero graphical user interface, one needs a computer with a 1.0 GHz processor, 1 GB memory, and a DirectX 9 or Directx 10 graphics card with at least 128 MB memory and supports Microsoft's new Windows Display Driver Model. This page was last modified on 3 April 2019, at 17:44. This page has been accessed 7,086 times.